I always have wonderful crafting goals and all sorts of plans for what I'm going to accomplish, and then often fail to achieve them as the year takes it out of me. So I am not putting any particular goals on myself, but there is one thing I would like to accomplish that is not unreasonable to do. I bought myself over the last couple of years a whole pile of art courses through a couple of mediums. I have about 5 art courses I bought through the platform Udemy.com (I recommend only buying from there during a sale) and I have some courses I bought from craftsy of pen and ink drawing. The very simple and I think quite reasonable goal is to work my way through the courses. This just means taking the time to watch the videos and start drawing more often. I have a couple of character art drawing stuff and figure drawing classes. I also have a chibi book that I started working my way through and got about half way through before I just stopped. The other day while on the phone I was drawing in my book while listening to the instructions and this little character is what I came up with. I love the face of this little character but I messed up the portions of the body. 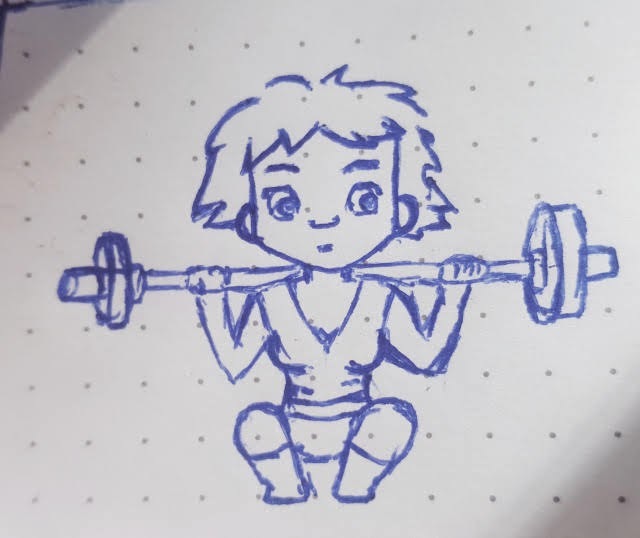 Although it's a chibi, therefore the body is deliberately out of portion with the head, the body needs to be in proportion with itself and I want to get better at that! So this is my drawing goal... watch the classes that I spent money buying and practice and improve so I can draw better when I want to. I like just sitting and drawing small little things and enjoying creating characters, they're simple and easy and look so cute. I don't think this is an unreasonable goal or one that I can't do on a regular basis even once uni starts back up.